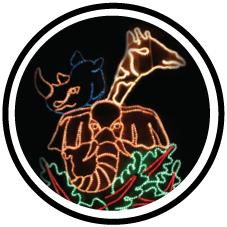 Enjoy a holiday event for the whole family with a dazzling display of approximately 150 lighted animal and holiday fixtures along with 800 luminarias adorning the pathways. Plus, live performances from local bands, church and school choirs, arts & crafts show in the special events building, hot chocolate, churros and more 6:00 p.m. to 9:00 p.m. Fee: $2.50 or donate a new, unwrapped toy for Toys for Tots and get in FREE. Zoo members get in free with their membership cards. Click on tickets button below to buy your tickets today. The Gladys Porter Zoo works on various worthy conservation projects. Additional funds to pay for expenses that are not covered by grants are always in need. Read more about our projects on our Conservation page. To help us further our conservation initiatives make a donation to our conservation fund. The Gladys Porter Zoo is an oasis nestled in the center of Brownsville, Texas. With 28 acres of lush tropical plants and some 1,600 animals, the Gladys Porter Zoo is known for its successes in breeding endangered species of wildlife.